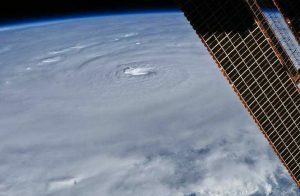 Colorado State University (CSU) tropical weather forecaster Philip J. Klotzbach has increased his prediction of expected activity from the 2017 Atlantic Tropical Storm & Hurricane Season, calling for 15 named storms and 8 hurricanes this year. All of the hurricane forecasters we track have released increased predictions for the number of named tropical storms, hurricanes and major hurricanes they expect during the 2017 season so far. The reinsurance and ILS fund sector will have a close watch on the tropical Atlantic at this time of year, especially so as the forecast predictions rise. Klotzbach joins the rest with an increase to his forecast, but also taking into account the fact three tropical storms have already occurred. 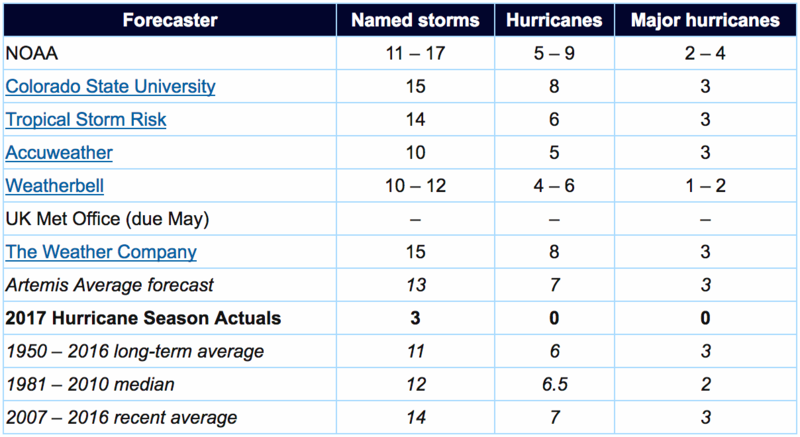 The Colorado team had already increased their forecast, from the early outlook for 11 named tropical storms, 4 hurricanes and 2 major hurricanes of category 3 strength of greater, to a start-of-season 14 named storms, 6 hurricanes and 2 major storms. Now those figures have been increased again, to 15 named tropical storms, 8 hurricanes and 3 major hurricanes of category 3 strength or greater. The increase from Colorado State’s Klotzbach and team takes our Artemis average forecast for 2017 Atlantic tropical storm and hurricane activity up to 13 named storms, 7 hurricanes and 3 major hurricanes, across the forecasters we follow. An increase of 1 hurricane. The landfall probabilities forecast by the Colorado State team have increased as well, with them now giving a 62% chance for at least one hurricane to make landfall on the U.S. coast, above the 52% average and up from the 55% chance it gave in April. For Florida and the East Coast the probability of a landfall is seen as 39%, above average and up from 33%. While for the Gulf Coast it is 30%, above the average but actually slightly down from the previous forecasts 32%. The reasons for the increased forecast remain the same, but the team now cites a diminished chance of a significant El Nino event in 2017, but remains concerned about “anomalously warm” subtropical Atlantic waters. For reinsurance markets, catastrophe bond and insurance-linked securities (ILS) investors or funds, the increased forecasts and predictions of landfall probabilities mean that the 2017 Atlantic hurricane season could see above average activity. 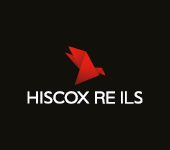 Whether that results in major reinsurance, ILS or cat bond losses remains unforeseeable, of course, as location of landfall remains key as insurance exposure can vary so wildly along the U.S. coastline. However, with the landfall probabilities having risen again for the U.S. east coast and Florida it means a summer of watching the tropics is ahead for those allocated to reinsurance contracts. Just over a week until our ILS Asia 2017 conference, get your ticket now.